Dermal fibroblasts are differentiated mesenchymal cells that regulate the extracellular matrix through the production of dermis components. Dermal fibroblasts can be damaged by reactive oxygen species induced by ultraviolet rays and chemicals. 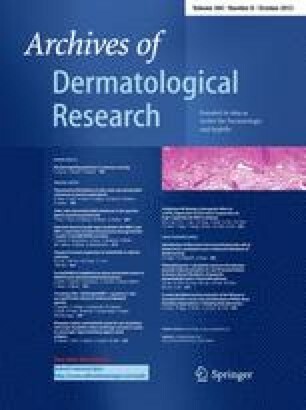 In addition to its effects on the dermis, oxidative stress poses a major threat to organisms and is believed to play an essential role in many disease processes. In this study, we show that human dermal fibroblasts (HDFs) express sphingosine-1-phosphate (S1P) receptors S1P1, S1P2, and S1P3. In addition, cell viability of HDFs is increased by phytosphingosine-1-phosphate (PhS1P) via regulation of the Jun N-terminal kinase (JNK)/Akt pathway. Interestingly, regulation of the JNK/Akt pathway by PhS1P attenuated H2O2-induced cell growth arrest. Together, our data indicate that PhS1P attenuates H2O2-induced growth arrest through regulation of the signal molecules Akt and JNK, and suggest that PhS1P may have value as an anti-aging material in cosmetics and medicine. J. P. Lee and H. J. Cha contributed equally to this work. The online version of this article (doi: 10.1007/s00403-012-1241-5) contains supplementary material, which is available to authorized users. We would like to thank all other members of Coreana Cosmetics Co., Ltd. and Damy Chemical Co., Ltd. for their support. This paper was supported by Konkuk University in 2011.